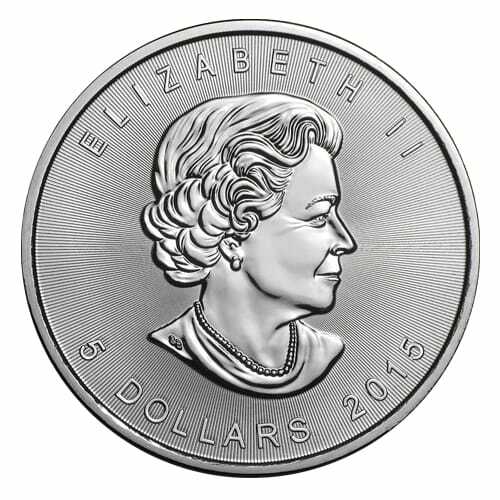 The artwork of the Canadian Silver Maple Leaf repeats that of the Canadian Gold Maple Leaf, with three different effigies of the Queen on the obverse, at 39 years old, 64 years old and after her Golden Jubilee at 79 years of age. The ever-present maple leaf covers the reverse, but was redesigned in 2009 by artist Dora de Pedery-Hunt, the designer of the 64 year old Elizabeth II effigy. On many of the coin’s anniversaries, such as in 1998, 2003, 2008 and 2013, additional changes to face of the coin have been exacted. The 1998 Silver Maple Leaf anniversary coin was a ten ounce beast, issued at a value of $200 Canadian, but with a $5 face value. In 2003, the Royal Canadian Mint issued a five coin set of 1 ounce, 1/2 ounce, 1/4 ounce, 1/10 ounce and 1/20 ounce coins, with the maple leaf on the reverse receiving a famous Royal Canadian Mint hologram treatment. For the 20th Anniversary in 2008, the Silver Maple Leaf was actually plated with gold on the reverse side. More recently, in 2013, the RCM released several versions of the indefatigable Silver Maple Leaf coin. The original effigy of Queen Elizabeth II, by designer Arnold Machin, returned on the obverse of the 25th anniversary of the coin. There are also versions of the coin with artist Jean-Louis Sirois’ gold-plated “echo” silver leaf maple on the reverse. These are stunning works of art, with the Machin portrait of the queen looking more elegant than ever. With any of these coins, be prepared to take possession of an asset that is not only valued based on its precious metal content, but also due to its artistry and technical superiority. 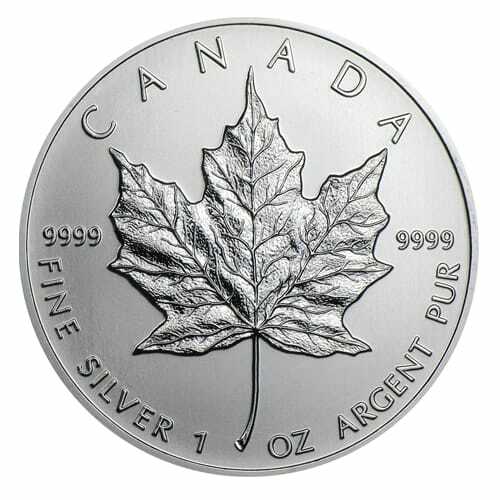 To learn more about Canadian Silver Maple Leaf coins and to get current pricing, please call us at (800)355-2116.